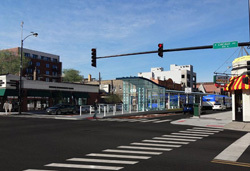 The Chicago Transit Authority and the Chicago Department of Transportation announced plans this week to pursue a center-running Bus Rapid Transit line on a 16-mile stretch of Ashland Avenue between 95th Street and Irving Park Road. 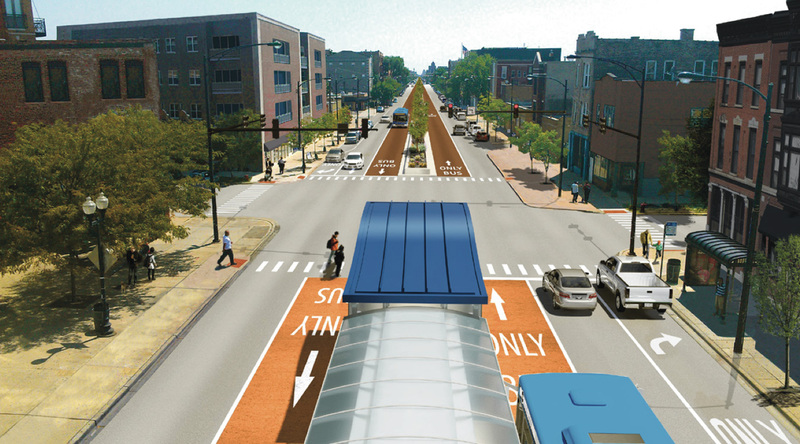 The agencies made the announcement following a year-long study of BRT service along Ashland and Western avenues. Current and proposed conditions on Ashland Avenue. CTA renderings. The first phase of the project will be a 5.5-mile section between Cortland Avenue and 31st Street. The proposed BRT service would include center-running dedicated bus lanes, level boarding stations, traffic signal prioritization, and pre-paid boarding. Each boarding station would include ticketing machines and real-time arrival information. Stops would be placed every 1/2 mile and at CTA rail stations. The CTA would purchase special articulated buses with a total of five doors on both sides for use on the BRT line. 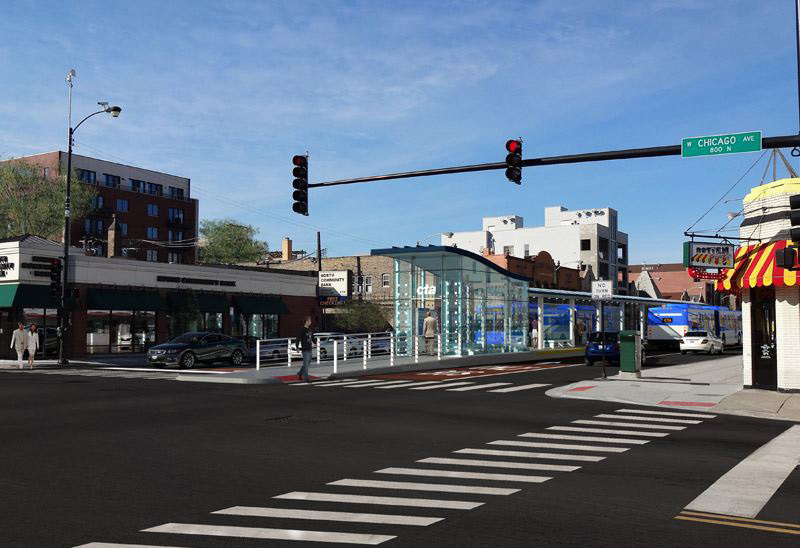 CTA estimates that the new BRT service will have an average speed of 16 mph, a significant increase over the current 8.7 mph speed of the #9 Ashland bus service. CTA says that the dedicated lanes will also improve reliability of the service. Boarding station concept design at Ashland/Chicago. CTA rendering. 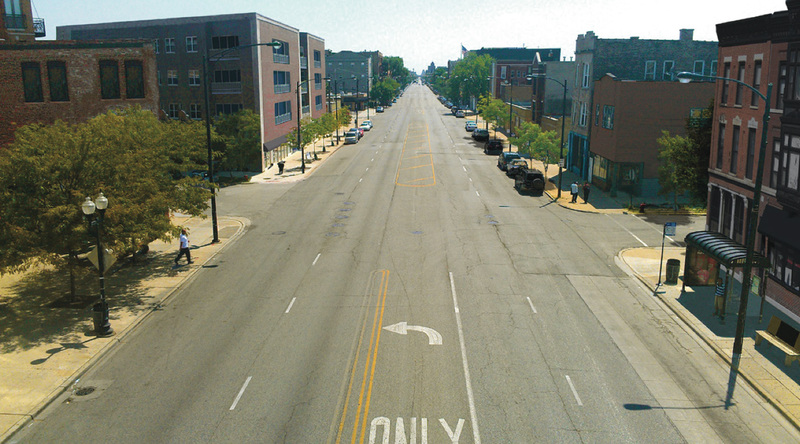 To accommodate the dedicated bus lanes and boarding stations, Ashland Avenue would be redesigned to eliminate one vehicular travel lane in each direction. Left turns would also be eliminated. A majority of parking and loading zones would be retained. The project also calls for new streetscaping, including landscaping and wider sidewalks. Local #9 Ashland bus service would be maintained and continue to run curbside. CTA and CDOT estimate that the initial 5.5-mile segment will cost $116 million, including the purchase of new buses. Funding for this phase has not yet been obtained, but the CTA plans to apply for FTA grants to cover the project’s capital costs. The plans would achieve the “gold-standard” rating for BRT service defined by the Institute of Transportation and Development Policy, making it the first BRT line in the United States to obtain such rating.